Here is a great way to enjoy the culture and beauty of the Philippines. 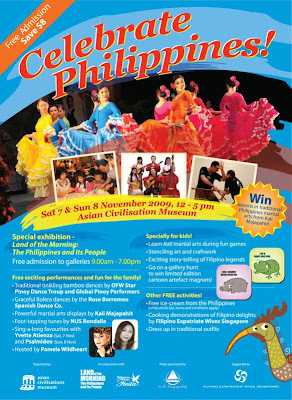 Free performances and exhibitions will captivate you over the weekend of the 7th and 8th November, 2009. Don't miss the beautiful dancers of the Rose Borromeo Spanish Dance Company and all the other exciting performances. There will also be kids' entertainment including arts and crafts activities, story telling, free ice cream and a scavenger hunt through the museum. You can treat yourself to some mouth watering Filipino food and learn more about the rich blend of Spanish and tribal influences in the food. So enjoy the festive mood and learn something about this rich and vibrant culture.